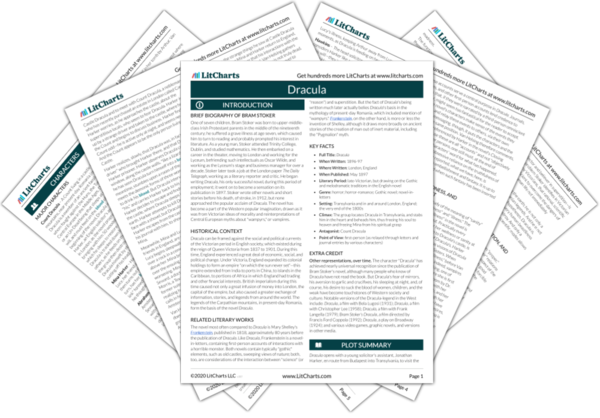 Instant downloads of all 942 LitChart PDFs (including Dracula). 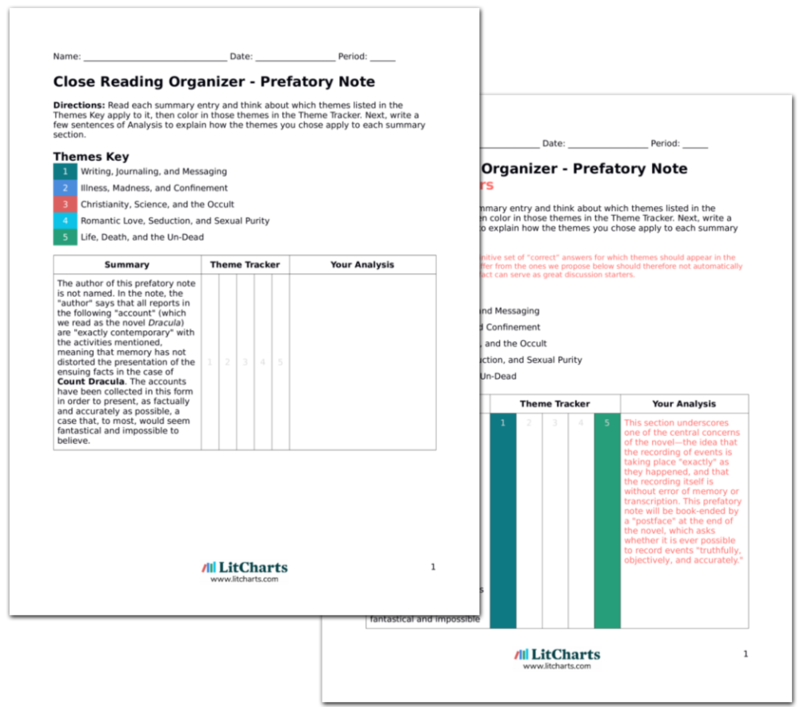 LitCharts assigns a color and icon to each theme in Dracula, which you can use to track the themes throughout the work. Mina's Journal. August 10. 11 p.m. Mina reports that Lucy appears to be doing somewhat better—and she wonders, in her diary, what the "new woman" (the socially-liberated woman becoming more prevalent during this time, especially in London) would do in her position: would a "new woman" wait for Jonathan? Give him up for dead? Would a "new woman" sleepwalk? Or is the "new woman" more powerful than these typically feminine, Victorian urges—fainting, fits of hysteria, and weakness? A pointed reference to competing social theories of the time. In late-Victorian England, the "new woman" was emancipated from her husband, was able to work and look for fulfilling life-experience outside her marriage, and was believed, by some, to be sexually liberated (and therefore corrupt) as well. Mina and Lucy appear to take pride in the fact that they are both "powerful" women and also ladylike in the "old" manner. Mina's Journal. August 11. Mina awakes to find that Lucy has sleepwalked out of the house—Mina follows her up to the cemetery, where she sees Lucy, in her nightgown, half-reclined over a tombstone, enshrouded by fog, with a shadowy figure bent over her. When Mina reaches Lucy, the figure and fog disappear—Lucy appears flushed and is breathing heavily. An important scene in the novel. It must be noted that Dracula's attacks on Lucy and Mina are, essentially, scenes of sexual assault—here, the sexual implications are obvious, from Lucy's reclined posture in the cemetery to Dracula's bending over her in a suggestive position. Mina takes a pin and closes Lucy's nightgown at her throat, then half-carries, half-drags Lucy back to the house in Whitby, where they sleep for the remainder of the night. Mina is not sure what has happened to Lucy, but believes that she has simply sleepwalked again, and that she (Mina) has dreamt the vision in the cemetery, of the shadowy figure. This "pin," which of course is not the cause of Lucy's holes in her neck, nevertheless serves as a method of rationalization for Mina, who seems not to want to believe that something or someone could have bitten Lucy while in the cemetery. Again and again in the novel the characters are unable to believe the occult things occurring and try to explain those events using non-occult means. Later that day, at noon, Mina looks at Lucy, sleeping soundly, as sees that Lucy has a small cut and trickle of blood at her throat. Mina believes she has cut Lucy by pinning her nightgown, and so apologizes to Lucy. The first reference to Lucy's blood, which has been drawn (by Dracula) and will be continually drawn over the course of her strange "illness." 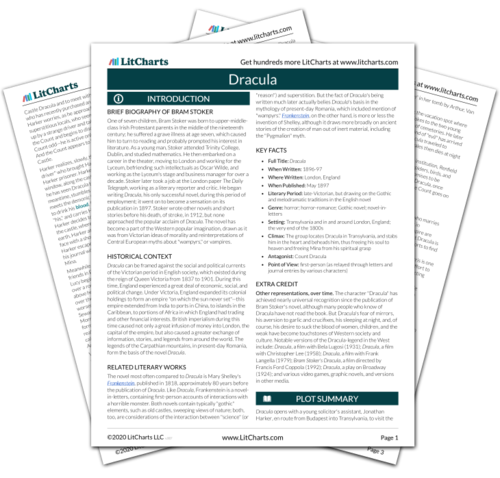 Get the entire Dracula LitChart as a printable PDF. Mina believes, that evening, that Lucy has somewhat recovered her strength, although Lucy has been quiet. Mina wonders, again, where Jonathan is—and she wishes he were close by, to provide comfort to her and to Lucy. Mina's worries for Jonathan seem only to be interrupted by her worries for Lucy, there in Whitby. Mina is very much in a caretaker role at this point in the novel, although she, too, will need to be taken care of, later on. Mina's Journal. August 12. Mina is surprised to note that, in the night, Lucy tries, twice, to leave the locked bedchamber; but in the morning, Lucy appears healthy, and Mina is somewhat relieved. Lucy is drawn by some kind of supernatural force to return to the scene of her assault—behind the fact that Lucy is under Dracula's control lies the Victorian fear that women, once sexually liberated, would become sexually voracious. Mina's Journal. August 13. Lucy, in her sleep (and without her knowledge), sits up and points to the window, where Mina, woken up, spies a bat trying to get in. Mina finds this odd, but Lucy goes back to sleep and does not wake till morning. The bat, unlike the dog, is not just a symbol presaging Dracula—it is the physical, animal embodiment of Dracula—as it appears he can turn into a bat at will, to approach his victims. Mina's Journal. August 14. Mina notes that Lucy appears to be longing for someone or something with "red eyes" in her sleep. Mina believes this is simply nervous exhaustion from Lucy's strange night in the cemetery—about which Mina has not spoken to Lucy, nor has Mina mentioned this strange night to anyone else in the family or in Whitby. Dracula's red eyes are mentioned several times in the novel. They, more than any other feature of his face or person, seem an indicator of his evil—for there is no human who has, naturally, red eyes. The red of his eyes is also a symbol for his bloodlust—his desire for the blood of others. Mina's Journal. August 15. Mrs. Westenra, Lucy's mother, confides in Mina this day that she (Mrs. Westenra) is quite ill, with only a few more months to live, and that any great shock could kill her. Mina believes it is right, then, that she has not told Lucy's mother about Lucy's strange night of sleepwalking all the way to the cemetery. Just as Arthur must care for his sick father, Lucy must care for her sick mother, who here is said to have a weak heart. What is more complex for Lucy, however, is her own illness—and Arthur must find time to care both for his father and his fiancée. Mina's Journal. August 17. Lucy's condition has taken a turn for the worse. Although Lucy eats well and sleeps well, Lucy wakes in the morning feeling drained and tired, and Mina notices that the pricks on Lucy's neck, which she thought were from the pin, appear to be growing larger, rather than healing. This upsets Mina, who vows to see a doctor in a day or two, if the wounds do not heal. What is inexplicable at first—the fact that Lucy appears to get better, and then appears to get worse, without much explanation for either case—is finally explained by Dracula, and his visits. When Dracula manages to "get to" Lucy, her condition deteriorates; if he does not get to her, she improves. Letter from Billington to Carter, Patterson and Co., London. This brief business letter, sent from the Whitby solicitor to a London property management company, announces that the 50 wooden boxes, filled with earth and taken from the Demeter, are to be deposited at the house Carfax, in Purfleet, as soon as possible. This small, technical letter is a useful "stage direction" in the novel, in case the reader is curious as to how the boxes were actually transported from Romania to England to Dracula's estate at Purfleet. Letter from Carter and Co. to Billington. Carter and Co. acknowledge the preceding telegram and promise to deliver the boxes to Carfax. Again, the exact progress of the boxes can be tracked using these letters, lending "verisimilitude," or real-seemingness, to the narrative. Mina's Journal. August 18. Seated once again at the cemetery with Lucy, Mina asks her friend if Lucy dreamt at all during the strange sleepwalking night earlier that summer—Lucy said she did in fact dream, of a shadowy figure with red eyes, and that she heard dogs barking loudly all around her, until Mina woke her up in the cemetery. Mina finds this dream terrifying, but Lucy laughs it off as a trifle. What is interesting, here, is that the dream ends up not being a dream at all, but an accurate memory of an event—Dracula's assault—that really took place. In the novel, characters are continually confusing real events with dreams, and dreams with events they thought to be impossible or fantastical, but are actually real. Mina's Journal. August 19. Mina receives word from Hawkins that Jonathan is alive, though he is recovering from an illness "out east." Hawkins tells Mina that she ought to take the train and meet Harker "out there." Mina is thrilled to have news that Jonathan is not dead. Finally, Mina receives word from Harker. One might feel that Stoker has downplayed Mina's worries about Harker during this intervening period of time, but it is not clear how long his business trips usually take, and Mina seems to understand how difficult communication is between England and Transylvania. Letter from Sister Agatha, Nurse, in Budapest, to Mina. August 12. The presiding nurse, caring for Jonathan in Budapest, writes to Mina that Jonathan is suffering from brain fever there, but that his condition appears to be improving. The nurse says that Jonathan was found in Klausenbergh by a policeman—Jonathan was raving about blood, demons, and violence, and the policemen helped him onto the train to Budapest, where he was found by authorities and delivered to Nurse Agatha's hospital. The nurse asks that Mina come quickly to Budapest to see her fiancé. Here, again, Stoker places together the twinned notions of "illness," or "madness," and genuine dismay at events that defy scientific explanation. In the beginning, the authorities and nurses believe that Harker must have been crazy, to have "raved" about blood and the supernatural. But of course it turns out that Harker is correct, and that those denying his visions were in fact the one's who were "crazy," or at the very least incorrect. Seward's Diary. August 19. Early on the 19th, Seward is called by orderlies to see Renfield, who appears to be in a kind of mania. Renfield has given up on his experiments with insects and birds, saying, now, that "the Master is at hand," and that he, Renfield, has no reason to deal with any other earthly authorities. Seward is shocked by this bizarre change in Renfield's behavior. Renfield is a more interesting case of the above problem. He probably is "crazy" by medical standards—his behavior fits the common description of bipolar disorder—but he also is, truly, being visited by Dracula, and is under the "master's" influence. Later that night, Seward is woken up by guards to hear that Renfield has escaped from the asylum. Renfield runs into the neighboring estate at Carfax, which Seward does not know has been purchased recently by Dracula. There, as Seward approaches Renfield, he hears Renfield pledging allegiance to the Master, but does not see with whom Renfield might be speaking. Seward and the guards manage to get Renfield into a straight-jacket, but Renfield continues to promise that he will serve his master. Seward is shocked by Renfield's immense strength, as the guards restrain him. Again, Seward is unable to connect Renfield's insanity and ravings to the presence, so close by, of Dracula's new property, Carfax. Of course, Seward does not know that Dracula owns that house, but Seward surely sees, as in this episode, that Renfield is attracted to that house, that the Carfax estate is a source of power for the supposed "lunatic," and that Renfield will stop at nothing to serve his master, whoever that may be. Schlegel, Chris. "Dracula Chapter 8." LitCharts. LitCharts LLC, 28 Jan 2014. Web. 21 Apr 2019. Schlegel, Chris. "Dracula Chapter 8." LitCharts LLC, January 28, 2014. Retrieved April 21, 2019. https://www.litcharts.com/lit/dracula/chapter-8.